It was great to see the front page of the Peterborough Telegraph last week – with the news that Bill Kenwright is bringing back a string of major West End shows to the city. Behind the scenes we have been working all year to help make this happen – and the council will be working with Bill and his team to promote the run. The new season opens in November with Jesus Christ Superstar, and other performances include The Sound of Music, Dr Seuss’ The Cat in the Hat, and Miracle on 34th Street. I had the pleasure of sampling some of the many culinary delights at last weekend’s Peterborough Italian Festival. The star of the show was restaurateur and TV personality Antonio Carluccio, and I really enjoyed meeting Antonio and tasting the flavoursome mushroom risotto being dished out at his stall. Judging by the considerable queues at the food stalls I wasn’t the only one savouring the Italian cuisine on offer at this superb, well organised, city centre event. I would like to thank the Italian Community Association and my officers for all their hard work. However, my role will be reversed this weekend. It will be me working behind the scenes to ensure a city centre event runs smoothly. This is because I will be volunteering at Metal’s Harvest Festival, an event making its debut in the city when it takes over Cathedral Square on Saturday and Sunday. I am told my role on Saturday will be to make sure all the event’s staff and volunteers are kept fed and watered over the course of the day, and that the festival area is kept clean and tidy. No pressure! 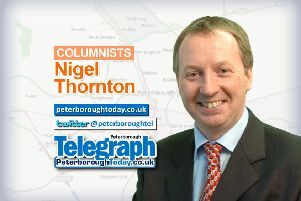 The event itself will celebrate the relationship between Peterborough and its rural countryside. My council ward is Glinton and Wittering, an area I have been proud to look after for a number of years. I am fully aware of the joys living in the country brings with it, with wide open fields and woodland to explore, but it also has its economic pressures, not least in farming and agriculture. It is no great mystery the council has had a slightly difficult relationship with farmers and the agricultural community over the last few years. But this summer a new strategy for the council’s 3,000 acre Farms Estate was produced by a specially set-up Task and Finish Group. This strategy will make sure the estate is a productive agricultural asset and encourage more young people to consider farming as a career. The rural community is large part of Peterborough’s heritage and this is why I am particularly pleased to see Metal hosting this Harvest Festival. It is a great way to connect people to the land and its associated harvest rituals, whilst promoting local food and its suppliers. At its centre will be a dinner for 500 people on Sunday and a procession of local bakers, gardeners, farmers, dancers, and musicians giving thanks to the land. Offerings will be made to celebrate the festival through the sharing of food, conversation and song. Celebrating traditions is something Cambridgeshire does so well. You only have to witness the universal appeal the Whittlesea Straw Bear has each January.